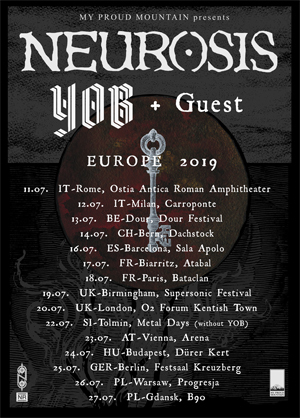 Oregon’s cosmic trio YOB return to Europe this summer opening for doom metal legends NEUROSIS. The tour begins July 11 in Alperstedt, DE and ends July 26 in Gdasnk, PL. All confirmed tour dates are listed below. YOB are touring in support of their album Our Raw Heart, that has received high praise, appearing on end-2018 best of lists including Decibel Magazine (#1), Loudwire (#1), Metal Hammer UK (#6), Rolling Stone (#14), NPR (#49), Pitchfork & many more. YOB’s Our Raw Heart is out now on CD/LP/Digital via Relapse Records. Physical packages are available via Relapse.com and Digital Downloads/Streaming Services.